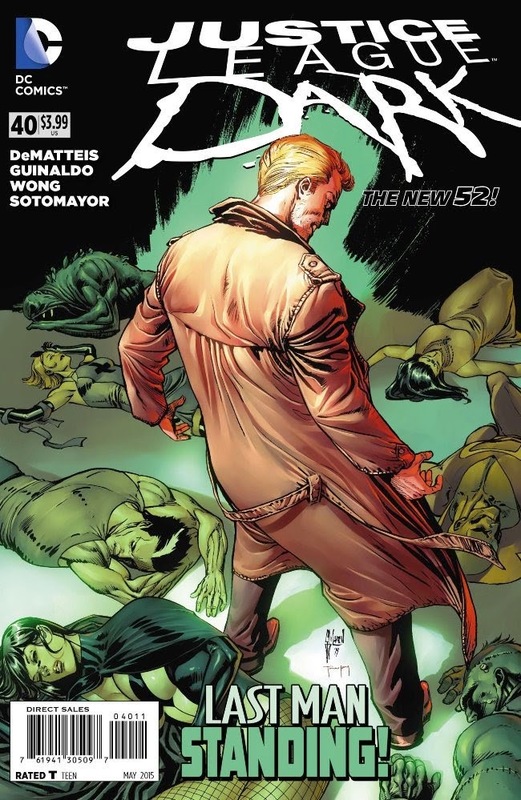 The final issue of Justice League Dark is on sale today and I can’t let it vanish into the mists of comic book history without noting what a joy it was playing in the supernatural corners of the DC Universe. One of the reasons I eagerly accepted the JLD assignment was because I wanted to work with the brilliant Mikel Janin, one of the very best artists working in the business today: his collaboration with my predecessors on the book, Jeff Lemire and Ray Fawkes (my co-conspirator on the Forever Evil arc), was what made me a JLD fan in the first place. Mikel eventually left the series, but his replacement, Andres Guinaldo, was every bit as good. It was a genuine pleasure watching Andres’ work—usually embellished by the equally-superb Walden Wong—evolve from issue to issue. In some ways, the deepest connection a writer makes is with the characters—and the Justice League Dark crew featured some of the best characters in the entire DCU. Constantine, Zatanna, Deadman, Nightmare Nurse, Swamp Thing and the rest are all rich, multi-layered creations, each one adding immeasurably to the stories. (It was a special kick getting to reunite with Andrew Bennett, the star of I…Vampire—a series I created at the very beginning of my career.) Over time, they stopped being “characters” and started being friends. With JLD (and its sister book, Trinity of Sin) gone, what’s next for me? Well, there’s the ongoing (and slightly retitled) Justice League 3001 with Keith Giffen and Howard Porter, a new (and top-secret) DC project that I’m very excited about, the return of Augusta Wind at IDW, another (top secret) project for new kid on the block Lion Forge Comics, several animation projects (including multiple episodes of the upcoming Be Cool, Scooby Doo and another DC-related direct-to-video project, following up next month’s Batman vs. Robin), the script for a live-action television pilot—and more. So things are busy and life is good. But I’m sure going to miss flying across the universe in the House of Mystery. Today is William Shatner's 84th birthday. (If you want to know why I love the guy, read this.) With the recent passing of Leonard Nimoy, Shatner seems more of a national treasure than ever (well, considering he's Canadian, I guess he's an international treasure). Captain Kirk has been a part of the pop cultural zeitgeist for nearly fifty years now, but, for me, Shatner's greatest performance, and most memorable character, is Boston Legal's Denny Crane. But why do we have to choose? Happy birthday, Mr. S: Here's to many more. For me, the original Star Trek is the science-fiction equivalent of the Beatles and William Shatner and Leonard Nimoy are the Lennon/McCartney of the franchise. (Does that Make DeForest Kelley the Enterprise's George Harrison?) Leonard Nimoy's passing has reminded me just how much Trek has meant to me since I first encountered it (in glorious black and white. We didn't make the jump to a color set for a few more years) during its original run and what an incredible impact it's had on so many lives. 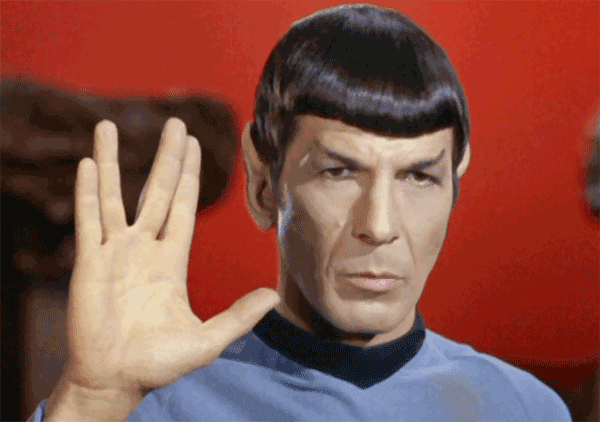 Of course Nimoy was far more than a pointy-eared Vulcan. He performed a wide variety of roles over the years: I remember seeing him on Broadway, back in the 70's, playing Doctor Dysart in Equus and, more recently, being delighted by his appearances on Fringe as the mysterious William Bell. Nimoy was also a poet, a photographer, a political activist, patron of the arts and, by most accounts, a man of heart and integrity. The internet is filled with tributes but (for me, at least) there's nothing anyone can say that would be more heartfelt and eloquent than Doctor McCoy's words—written, I suspect, by the great Nicholas Meyer—at the end of Star Trek II: The Wrath of Khan: "He's not really dead as long as we remember him." Heartfelt condolences to Leonard Nimoy's friends and family.